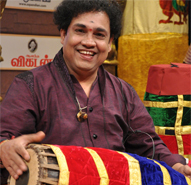 Born in the family of percussionists, Tiruvarur Vaidyanathan took to Mridangam very early in life. His natural sense of rhythm and comparability with instrument made him perform in concerts even as he was learning. He served SIFAS, Singapore as a full time teaching faculty during the year 2001 to 2003. During this period, he identified many talents and groomed them to perform extraodinarily. Four of his SIFAS disciples, gave Arangetram in Mridangam and have been performing in various concerts too. His playing style is characterized by melodic richness, technical dexterity, balanced use of the left and right sides, clarity at higher tempos and a keen sense of anticipation which all together provides a complementary percussion support that enhances the performance of the main artist and takes the concert to great heights. He has so far accompanied prominent artists for more than 100 cassettes and CD recordings including live concerts and jugalbandhies. In 2004, he teamed up with Dr.Balamuralikrishna and Sri Bhimsen Joshi for a memorable Jugalbandi at Banglore. Though Vaidyanathan is based in Chennai, India he keeps trotting around the globe as dictated by his professional commitments for performance and teaching. Tiruvarur Vaidyanathan with his ability to shape budding musicians and morph them into professional performers has made his mark as a teacher in the field of percussion. His artistry grew under the tutelage of Mridangam maestro Shri Karaikudi Mani. Under Shri Mani's guidance, Vaidyanathan blossomed into a full-fledged mridangist with a capacity to accompany all the leading musicians. He has accompanied music doyens viz. Dr. Balamuralikrishna, Smt M.L. Vasanthakumari, Dr N. Ramani, Sri Maharajapuram Santhanam, Sri K.J.Yesudas, Sri K.V. Narayanawamy, Smt D.K. Pattamal, Sri T.V. Sankaranarayanan, Sri M.S. Gopalakrishnan, Sri T.N.Krishnan, Sri U.Srinivas, Smt Aruna Sairam, Smt Sudha Raghunathan, Smt Bombay Jayasree, Smt Nityasree Mahadevan, Sri Ravikiran, Sri Sanjay Subramanian, Sri Unni Krishnan, Sri T.M.Krishna, etc. Grandfather Sri Thiruvarur Kunju Iyer and his uncle Sri Tiruvarur Nagarajan.